A 266-Square Meter Sized Iceberg Breaks Off The Glaciers In Antarctica! The latest iceberg fractured from the center of the ice shelf rather than the sides. A large chunk of ice, approximately of four and a half times the size of Manhattan fell of a glacier in Antarctica. This is the second time in the past two years that a huge iceberg has split and shed from the area. The breaking off this chunk could accelerate the loss of more ice. This would eventually overpower the fence erected to prevent the land-based ice from flowing into the sea. The Pine Island Glaciers has been one of the largest suppliers to sea level rise on the continent for the rate at the which it is losing ice is rapidly rising since the last 40 years. The island glacier is located in the West Antarctica. A 224-square-mile iceberg calved from the glacier in 2015. The latest split has resulted into a formation of a 103-square-miles in that area, according to the photographs by satellites over the weekend. 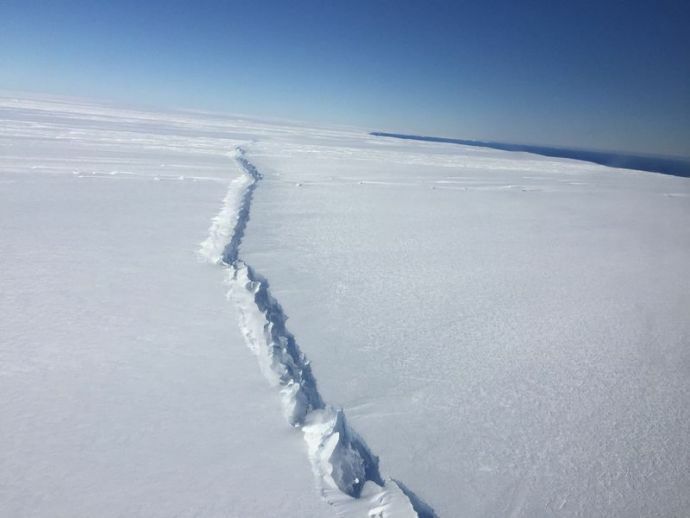 This is the fifth major splitting event since the year 2000, says Stef Lhermitte, a satellite observation specialist at Delft University of Technology in the Netherlands. The masses of ice are chipping off a floating portion of the glacier which is not much of a threat to the rise in sea levels by themselves. They’re just like the ice cubes in a glass of water: when they melt, the water level in the glass doesn’t rise. It is the floating ice shelves that create a blockade which keeps the ice that is hanging out on land, from flowing into the sea. In the absence of the barriers, the excess water from the continent could mean higher seas. 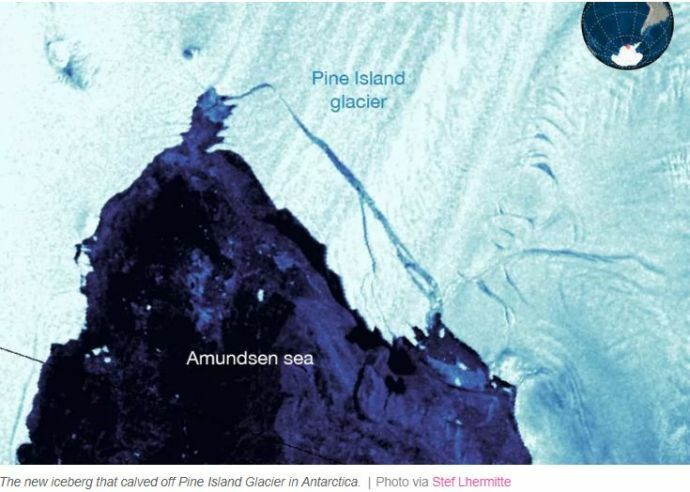 According to The Washington Post, Pine Island Glacier alone could raise sea levels by 1.7 feet if it all melted. That’s a good enough reason for the scientists to keep a constant eye on it. It is not uncommon for icebergs to split off in Antarctica. However, the chunks that broke off the Pine Island Glacier are strangely odd. 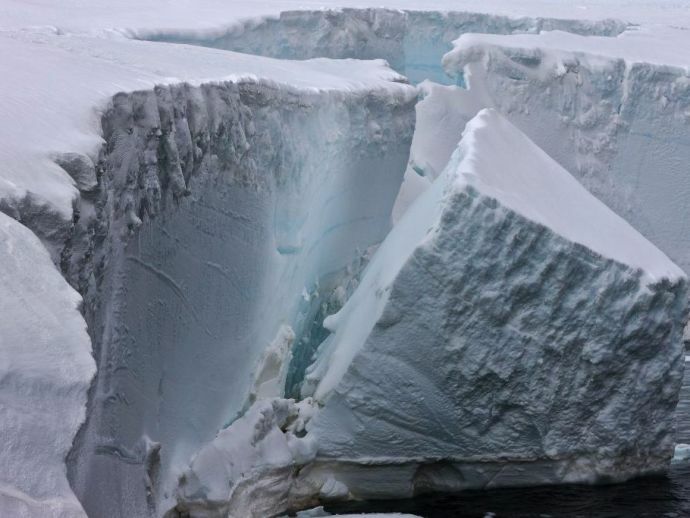 For instance, the latest iceberg fractured from the center of the ice shelf rather than the sides. Warmer oceans are the reason suspected behind this. The recent chip-offs makes the glaciers look like it is retreating. Pine Island Glaciers will be monitored closely along with the other ice shelves. The whole of West Antarctica alone might contribute 10 feet of sea level rise. And if that happens, it could spell doom for cities like New York and Miami.